The slab you see us pouring below used 120 yards of concrete. The cost per cubic yard of 3000 psi concrete for this slab was $92.00 dollars. That's $11,040.00 just for the concrete! The cost for a yard of concrete will vary in different parts of the country and all over the world. I can give you a good idea of what concrete cost per cubic yard in the Northeast part of the U.S.A. specifically Maine. 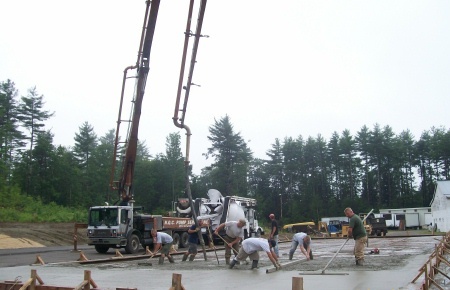 In Maine, where I live, I specialize in concrete floors and decorative concrete. Day's Concrete Floors, Inc is the name of my company. We pour a lot of 3000 psi. concrete for interior concrete floors and 4000 psi concrete for exterior concrete. The concrete cost per yard of concrete is $92.00 for 3000 3/4 psi concrete and $100.00 for 4000 3/4 psi concrete. 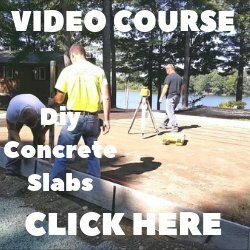 So 10 yards of concrete is approximately $1000.00 dollars U.S. here in Maine. Those are the two most popular mix designs we use. There are many others but in general that should give you a good starting point. Any admixtures like fibermesh, water reducers, and accelerators will add to the cost per yard of concrete. I pay $4.00 dollars per yard for extra water reducer (most mixes have some already in it). I pay $4 - $8.00 dollars for liquid accelerator depending if I order 1% or 2%. If you're planning for a project in the future, it's important to check concrete yardage prices frequently with the concrete company to stay updated. 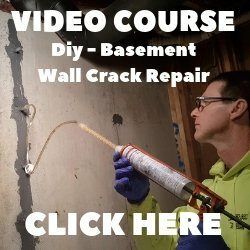 Here's a detailed list of prices for the cost of a yard/meter of concrete and the additives that can be go along with it. Feel Free to call them for any concrete pricing requests.